"Warren Winstead, first President of what was incorporated as Nova Univ"
Dr. Warren Winstead served as the first President of Nova Southeastern University 1965-1969. He was born November 10, 1927 in Virginia. He obtained his B.A. and M.S. from the University of Richmond. He later obtained a C.A.S. and Ed.D. from Harvard University. Dr. Winstead served as Director of Education for the United States Army Servicemen and their dependents in Europe before coming to work for Nova University of Advanced Technology (first official name of the institution) in 1964. He resigned as President of the university on November 3, 1969. Dr. Abraham S. Fischler, Dean of the Hollywood Education Center was appointed Executive Vice President in his stead (and later elected President in August 1970). 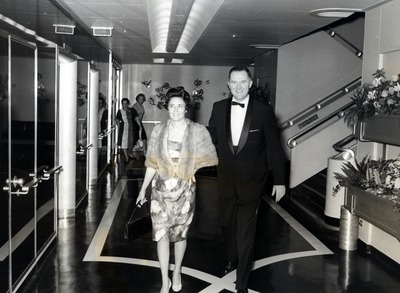 Dr. Winstead married Elizabeth Ferguson in 1959 and their son was born in 1960. Efforts by Nova Southeastern University Archives to locate an heir of the creator or a holder of the copyright to the materials were unsuccessful. If you know of a verifiable copyright holder for this item or if you have any question regarding the publication rights, please contact the Nova Southeastern University Archives. Scanned from a photographic print using a EPSON Perfection V700 Photo Scanner at 600 dpi in Tiff format and resized to JPEG 2000.